09.19.18 | Anti-Bullying Blog | Comment? Following requests from schools and youth organisations, NIABF has decided to extend the deadline for entries to the ABW18 Creative Competition. Entry is now open and will close on Wednesday 10 October 2018. The theme for ABW18 and for the competition is “RESPECT”. We will be exploring what the word respect means, how it feels to be respected, how we show respect to others and how, by being respectful, we can build a society free from bullying. Your entry to the competition must focus on this theme, showing how respect helps end bullying. Any entries which do not focus on this theme will not be eligible for shortlisting. This includes drawings, paintings, posters, sculptures, models, photographs, textiles- anything that you consider to be visual art. All entries must be original and unique – please do not copy anything you have seen elsewhere. You must not include any characters that you haven’t created. For example, a poster showing Minions being respectful will not be shortlisted. All entries in this category must be from individuals. Where possible, entries should be posted or delivered to NIABF – see details below. This includes dramas, documentaries, animations, music videos, dance and much more. Films must last no longer than 3 minutes. You must not include any characters that you haven’t created. For example, an animation using Disney characters will not be shortlisted. Entries in this category can be from an individual or a small group of no more than 6 children and young people. Entries must be submitted electronically, through an online file sharing service (e.g. Hightail, WeTransfer, Dropbox) – see details below. 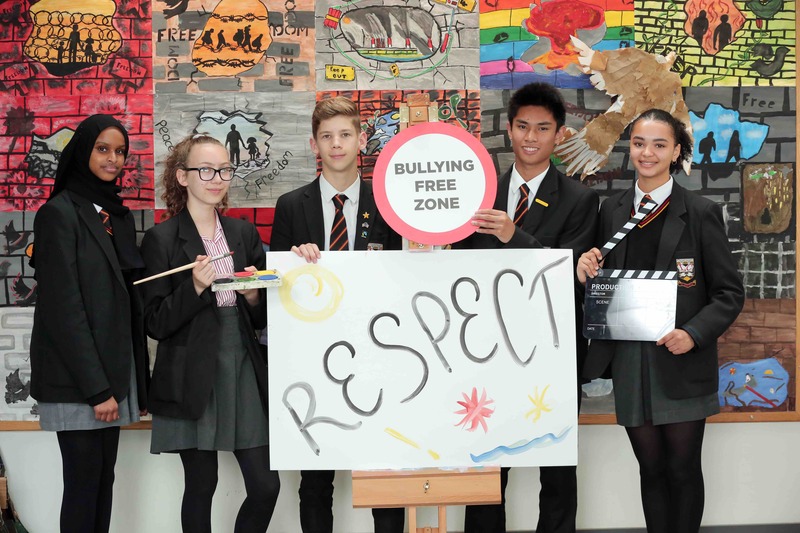 REMEMBER – all entries in both categories must focus on the theme of RESPECT and how this helps to build an anti-bullying culture in our schools and communities. What will happen to your entry? Entries which reflect the theme of respect and how this contributes to building an anti-bullying culture will be shortlisted for judging. Shortlisted entries will be judged by a panel, including members of NIABF. Prizes will be awarded to outstanding entries across the categories. Children and young people with a special educational need can choose to have their entries considered for an additional ‘merit prize’. Entries may be used for future anti-bullying campaigns. Due to the volume of entries we receive, NIABF cannot return any of the work. While the age categories are based on school year groups, entries can be submitted through any organisation working with children and young people that has registered to take part in ABW18. Children and young people with a special educational need can choose to have their entry considered for an additional Special Merit Prize. Entry is open to children and young people who attend a school or college in Northern Ireland. All entries must be submitted through a school, college, youth group or other organisation which has registered to take part in Anti-Bullying Week 2018. For information on registering, visit the NIABF website. All entries must be submitted by 2pm on Wednesday 10 October 2018. A completed entry form must be attached to each competition entry. You can download the entry form here – ABW18 – ART Competition Entry Form. If you have any questions about the competition you can contact us on info@niabf.org.uk.